The Men’s team went into this game without an outdoors win this season and missing their captain. However, we came out strong, getting two breaks in the first two points and putting Oxford on the back foot through pressure defence and looking to score quickly on offence. Oxford managed to get back into the game by using an effective side stack play to isolate a single cutter that we couldn’t always cover. This combining with a few personal errors from SB resulted in Oxford winning 9-6. JR’s strong deep cutting and tight man defence won him the SB MVP. Outdoor Varsity was the first big game of the outdoors season for both teams, and Cambridge Women's first time playing on a full size pitch with wind. This didn't dampen their enthusiasm and they came out hard, giving Oxford a good fight. 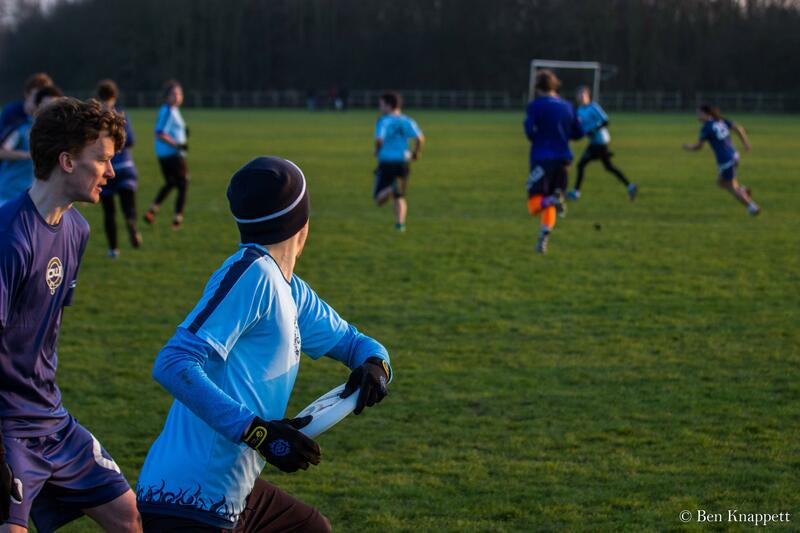 Oxford however, had the edge on Cambridge from the start, with cleaner offence and a strong defence, though Cambridge did not make it easy for them, attacking every disc and never letting up. The transition from the indoors to the outdoors season showed with some sloppy end-zone plays from both teams, but in the end the game was 11-2 to Oxford. The score doesn't reflect the intensity of play from the Cambridge Women and has got them even more determined to do well at Regionals. Having won the Men’s Seconds Outdoors matches the past 2 years, we were gunning to keep the wheel for a 3rd successive year. Coming out the gate strong, we started out with some high intensity defence and scored 7 points on the trot, taking the half with a bagel. With some outrageous throws like Joseph’s 5-yard hammer assist and some lucky second chance grabs, the first half was an extremely strong performance. An Oxford downwind point on offense to open the second half ensured that they weren’t kept off the scoresheet. 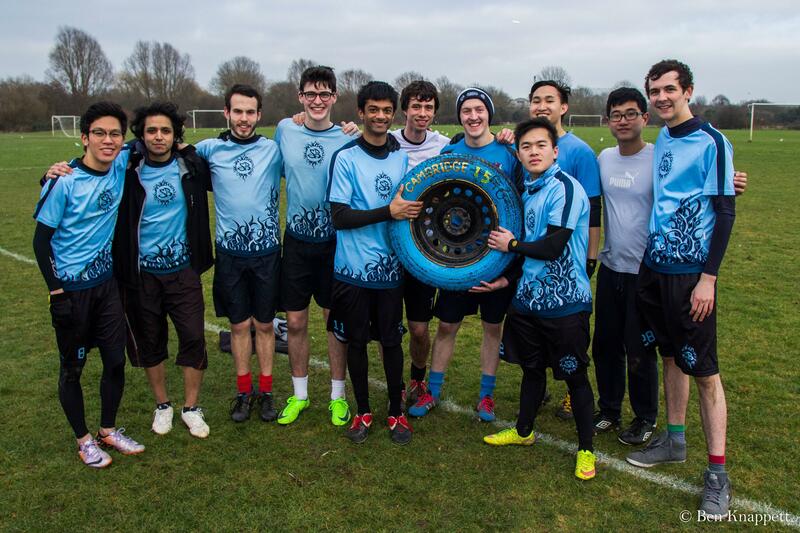 A deep throw from Theo to Ravi for the game, with a final score of 11-2, Cambridge keep the tyre. Alongside the student teams, a more mature set of players clashed this weekend in the return of the SB Alumni showdown. Oxford brought 9 grizzled veterans along to face off against 15 Cambridge old guard, in what turned out to be a fairly one-sided but enjoyable match. Oxford’s opening two points on the trot set the tone, as Cambridge struggled to keep up with the consistency and fitness of the opposition. Oxford took half 7-3 and while there were some flashes of brilliance in the Cambridge pan, Oxford confidently closed out the alumni match 15-5. 2017 kicked off the first ever set of Mixed Varsity games, and both teams showed up keen to win them. 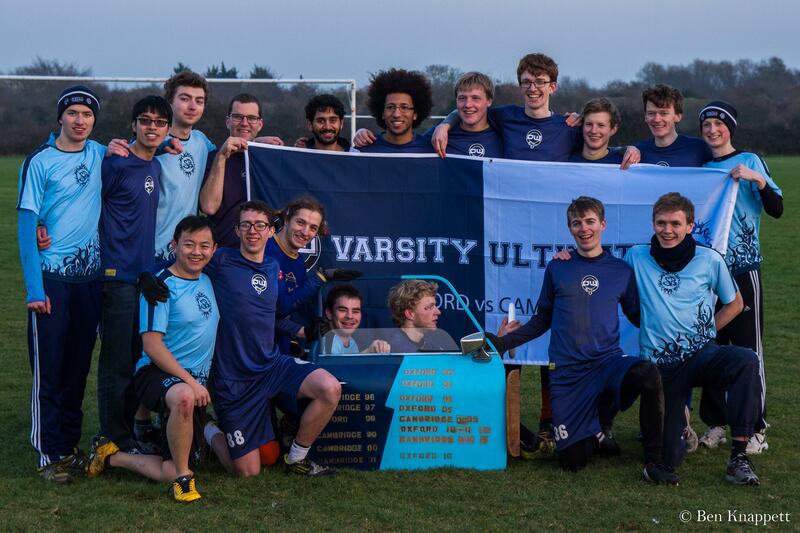 Despite taking place as the last game of the day, after intense Men’s and Women’s matches, both squads turned up in full force, with roughly 40 people total vying over the Mixed Varsity Trophy. However, the Cambridge squad struggled to find a rhythm in the ever-changing lines. We fought hard to halftime, barely losing the half 7-6, but Oxford managed to clutch the match in the later stages, taking the game 11-7. Overall, an intense and hard-fought battle to set the pace for the future mixed varsity matches to come. We came into the game excited to get some revenge for the mixed outdoors game. The plan was simple - defend the up the lines and be calm on offense. The D line did a great job of showing our O line how to execute this calm offense! 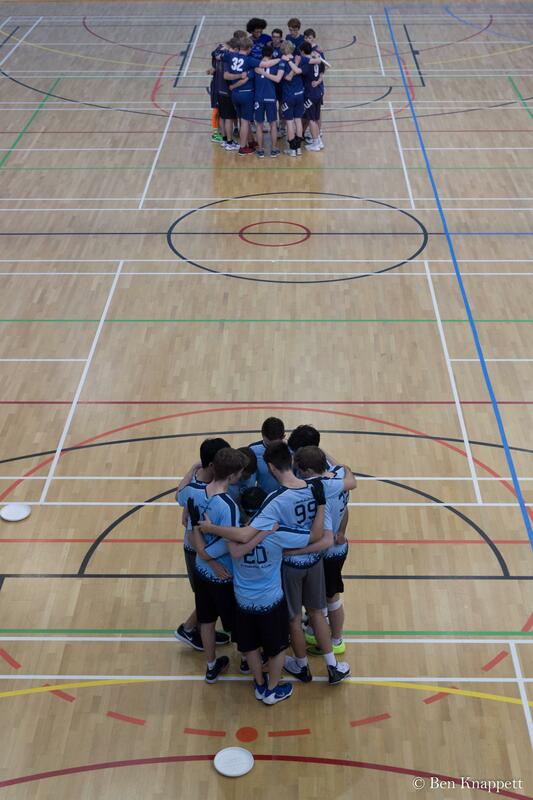 After getting a turn and JR converting the first point they were unlucky not to make it two on the trot. Unfortunately, the O line didn't manage to get the score, despite a fantastic point block from Tasha. We went down 4-2 and never managed to claw the difference back. Tessa's interception and quick thinking pass to score got us to 5-3 kept us in the game as timeout was called at 6-3. Cambridge brought the intensity after the break and pegged one back, but the Oxford put in a quick point to finish the game 7-4 and get their deserved win. SBW 2 start off their game against Oxford’s Women strong, scoring a few early goals after some chilly passes down the open side. However, WOW 2 were hot on their heels with Cambridge struggling defensively to shut down some quick handler-swing movement. 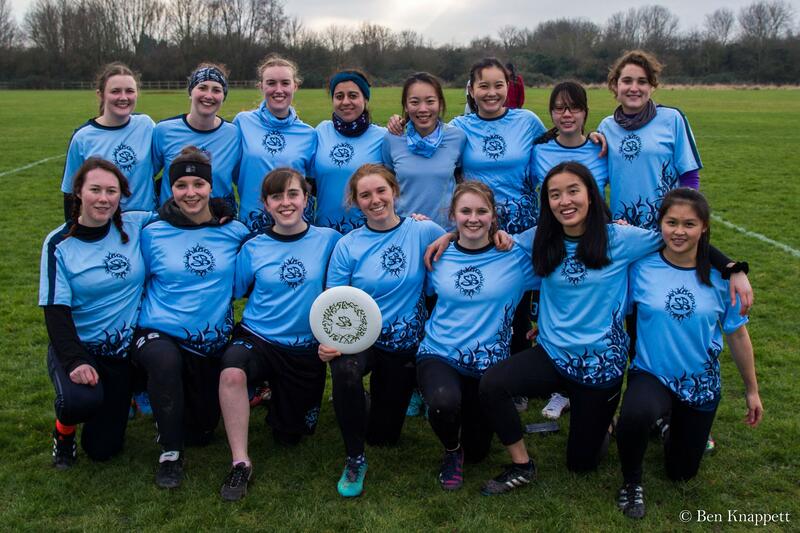 Both teams suffered from a few unlucky drops and wobbly passes that fell to the ground (to be expected from a relatively inexperienced set of teams), but overall the match was a great display of women's’ ultimate, with several stand-out plays from both sides. The game was hotly contested, with universe point deciding the game. Thanks to some great grabs from Cambridge, SBW 2 managed to come away victorious 7-6 (and should be very proud of themselves after vastly improving from indoor regionals last term!). We came into this game trying to translate our Outdoors performance to the Indoors. We played an honest man defence and a 2-1-2 ISO play on offense. Oxford started the faster and quickly had a 2-0 lead. We pegged them back to 2-2 but after a few sloppy points we found ourselves 5-3 behind. With time running out, we levelled the scores at 6-6 leaving a universe point decider. A long, nervy point followed with 15 turnovers total, before Henry scored the winning goal in the right corner of the endzone. After coming out slowly, the second point saw Tessa - one of the team’s most valuable players - suffering a collision ankle injury after scoring. This disaster seemed to wake us up, as we broke Oxford’s force and pulled off some slick 2-throw scores making the score 6-3 to SB, with 10 minutes to go. However, Oxford began to adapt shutting down the up-the-line and under options effectively, closing the score line to 7-7 with just 2 minutes remaining. The pressure got the better of SB, with some careless throw-aways near Oxford's end-zone and inability to shut down the experience WOW handlers leading to a final score of 9-7 to Oxford. However, the teams displayed admirable endurance (considering the previous night’s antics @ Spoons), and some great Women's Ultimate! After a tight outdoors game SB came into the game expecting another tough match. SB managed to produce another good start and went up 4-1 with tight man defence and clinical offence. This clinical offence mainly consisted of giving the disc to Tejas and letting him throw a hammer to JR in the endzone, which Oxford seemed unable to defend. Oxford managed to pull the game back to 6-5 using more of their deep game, but SB managed to win the game 8-5. Overall SB showed more composure on offence and smart poaching on Oxford’s side stack to get the deserved victory.